Noctua is a company that is known for the quietness and quality of their products, putting them on the top spot in the industry of cooling fans. They’re also that well known that they don’t need to sell their products based solely on marketing strategies. And with a plethora of coolers to count, the company sure has a lot to offer to the market. Today, we’re going to look at the NH-U9S from Noctua, which is a CPU cooler that is designed for smaller and more compact chassis that generally have issues when it comes to bigger coolers. It takes a whole lot to be at the top of the market, and it’s not just all about performance, but durability and quality as well. With that, let’s see if this NH-U9S from Noctua has what it takes to maintain its spot at the top as one of the best cooling brands out there in the market. Let’s start off with what’s inside and included in the box of this cooler. Noctua U9S Review – What’s in the Box? When we received the NH-U9S, we saw that it came in the usual Noctua package that sports a white and brown theme. You’ll find, at the top of the box, the classification that says “95-millimeter U-Type, tower Cooler”, and at the right portion of it, a silver sticker can be seen stating that the cooler features better compatibility. When it comes to the largest portion at the bottom of the package, it will give you a preview of the cooler through its fan. Not only that, but the biggest area provides just enough space to display a list of eight features of the Noctua NH-U9S. On the right side of the package, you’ll find a complete list of the device’s specifications which is on the large brown section to the left. On the bottom-right portion, you’ll see the cooler naming while two renderings with dimensions are listed on the bottom area. Now for the back of the box, there’s a bigger brown panel where you can find details regarding the device’s design, as well as what you can expect from the NH-U9S. These details are repeated in different languages to cater to all of Noctua’s international customers. Instead of making a text list of the details just like what’s on the front portion of the box, the left side features the information in a more in-depth fashion instead. You won’t only see an iconography of the NH-U9S’ features, but you’ll also get a good and detailed description for each of these. When you open the box, the first thing that you’ll see is the hardware box which covers the package that holds the cooler itself. We really liked how the package is marked with what items are included inside, so you don’t really have to look for any document to make sure of its contents. Noctua also knows how to completely protect their products since their NH-U9S is kept in double boxes. This is really nice since there are instances when products can get damaged in transit, especially when these aren’t packed securely or when exposed to rough handling. So we really appreciate what Noctua does with their coolers. Seeing that the NH-U9S is placed behind its 92-millimeter fan should already give you an idea of the device’s size. To put it simply, the cooler is much taller compared to the fan, and it really does an excellent job of concealing the fins that are behind it. As for the NH-U9S’s specifications, details about its compatibility tops the charts provided for this device. It’s good that the NH-U9S covers Intel sockets from the LG115x and more. It also covers for AMD compatibility and is for the FM1 and AM2 onwards; thing is, AMD installations will need the stock back plate. For its dimensions, the NH-U9S is 125 millimeters tall, 95 millimeters wide, and is 95 millimeters deep when the fan’s included. The cooler also weighs a total of 618 grams and this includes the fan as well. The 92-millimeter fan selected for the NH-U9S is specifically the NFA9 PWM fan that’s on an SSO2 bearing. The fan can spin up to a maximum of 2,000 RPM, thus, delivering around 78.9 airflow in cubic meters. This NH-U9S fan is also rated at 22.8 dbA, can spin for a total of 150,000 hours, and makes use of 1.2 Watts of power. Another good thing about this device is that it comes with a six-year manufacturer’s warranty. Noctua’s fans and coolers are popular for their outstanding longevity and great quality; and when it comes to their fans, the provided NFA9 comes with an MTTF rating that’s over 150,000 hours. As for the whole NH-U9S package, it comes with a six-year manufacturer’s warranty which is great for everyone. The NH-U9S belongs to the NH-U9 series which has a lineup of award-winning devices. It was first introduced in the year 2005 and has become the ideal choice for high-quality and silent CPU coolers. It has won hundreds of awards and recommendations from the most popular hardware websites and magazines worldwide. The layout of the NH-U9S has been revamped – it’s slimmer, has an asymmetrical build, and measures only 95 millimeters. It comes with the NF-A9 fan to not only offer you better cooling, but also to provide compatible. When you use the NH-U9S in the latest Intel and most of AMD’s mainboards, it does not overhang the RAM slots since it has a 95-millimeter design. This allows for complete access to the memory modules and you can ensure its compatibility with large heat spreaders and optional memory fans. A lot of mini-ITX mainboards that are Intel LGA115x-based feature a PCIe slot that can be seen next to the 95 x 95-millimeter socket zone. Unlike larger coolers that usually block the slot, the NH-U9S offers full compatibility with these cards whether you use ITX, ATX, or even microATX. Noctua’s exclusive AAO frame and a stylish aerodynamic design are highly optimized. These measure the Flow Acceleration Channels, allowing it to further enhance the efficiency of Noctua’s previous 92-millimeter models. These features also contribute to the cooler’s top-tier performance. The 92-millimeter fan included in the NH-U9S cooler supports the PWM to offer convenient speed management via the mainboard. With that, the maximum speed of the fan can be decreased by 450 rpk with the Low-Noise Operation; thus, providing lower noise during operation. The NH-U9S comes with an additional set of mounting clips if you need to add another fan to enhance your cooler’s performance. You can connect the two fans to one CPU fan header by using the Y-cable that comes with the retail fan. The NH-U9S complies with the Secu-Firm standard which is why it’s compatible with the old sockets when you use the NM-I3 mounting kit which is optional. It’s also compatible with the newest sockets, and for those coming out in the future, Noctua will provide new kits for these. This thermal compound offers professional level TIM solution, providing less thermal resistance and excellent reliability. We can say that the NH-U9S performs well despite being much smaller compared to its competition. 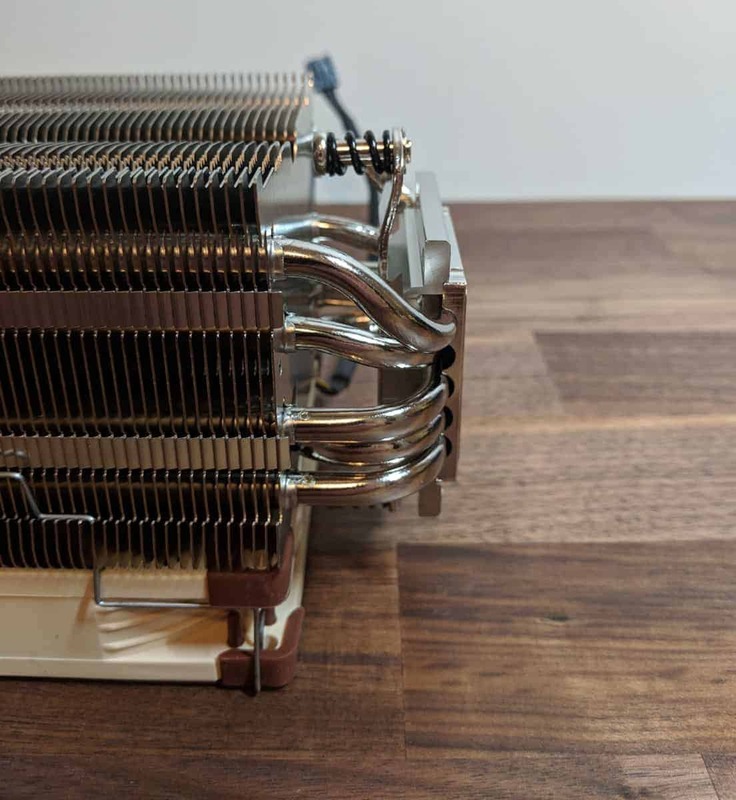 Generally, any cooler that features an adequately large airflow and heatsink can readily achieve low temperature, but it can be quite difficult to accomplish when it comes to a smaller form factor. Under heavy loads in both overclocked and stocked, the NH-U9S does a good enough job. Just remember that the cooler isn’t focused on overclocking; instead, it aims for small spaces in the ITX market. To get any form of noise, we literally had to move very close to the cooler to catch any sound. We can’t really say that the fan is super quiet, but considering that it’s a fan that spins quite fast, you’ll be hard-pressed to find a different fan, with this size, that can come close to its performance. While AIO (All-In-One) coolers are awesome, these don’t always fit your build budget or preferences. It’s also true that not all consumers opt to overclock, yet do like the idea of having low temperatures compared to the stock coolers. The NH-U9S has a perfect fit with Intel or AMD’s socket specifications, and it’s also a great device for smaller form factors such as the M-ATX or ITX motherboards. If you’re someone who has a chassis that has limited space, then the NH-U9S is surely better than any of the other high-end coolers available in the market today. With the NH-U9S, we saw that Noctua made an excellent product once again. It can dissipate heat within a small space which solves a common problem when it comes to smaller chassis and coolers. While AIO or All-In-One coolers are ideal for keeping your computer cool, it’s difficult to find small cooling systems that can fit if your chassis isn’t adequately large. Sometimes, users can’t also afford AIO’s. If you don’t really overclock, this NH-U9S cooler from Noctua is a great choice for maintaining lower temperature. Noctua is in a great spot in the market for their fans that offer excellent performance. If you’re looking for a smaller cooling fan that performs better than stock coolers, we recommend the NH-U9S since it will definitely give you more than what you pay for. You can get yourself a Noctua U9S for around $99AUD. For more information head on over to the official Notcua product page.